My daughter really took to the program. To start, your child takes a placement test to find out what their reading, spelling and/or math levels are. My daughter started at an age appropriate reading level in the Kindergarten stage. Within a few short weeks, she worked on sight word recognition, rhyming, sentence structure and reading comprehension. She quickly moved from a Kindergarten level to an almost 2nd grade reading level and had fun doing it. It gave her a wonderful boost in confidence and she started reading aloud proudly every day. It even inspired her to start reading chapter books by herself. Now, my little is reading up a storm. With all this reading, she was in serious need of some bookmarks. 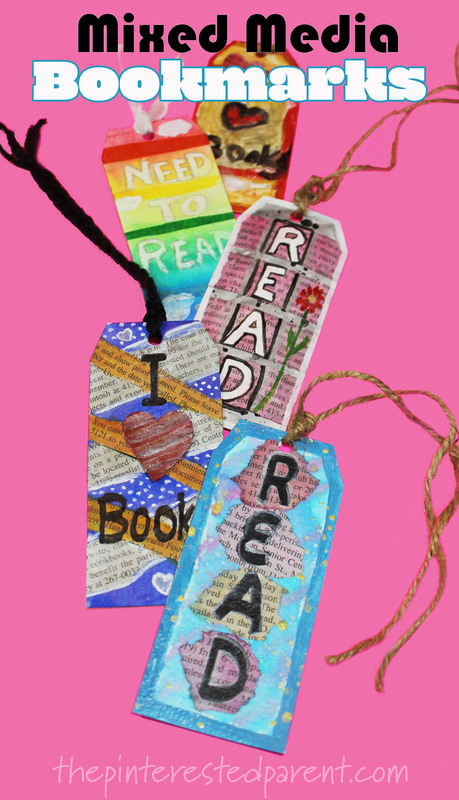 These mixed media bookmarks celebrate her love of reading and books. Cut a piece of watercolor paper in half the long way. Cut 2″ strips out of the halves. You can choose to leave them rectangular or slant the top edges to make a bookmark shape. Now is the fun part. Our bookmarks reflected our love of books. They contained simple messages like “READ” and “I love books” Design yours however you like. Use paint, markers, paper, tissue or anything else you can think of. Small pieces of watercolor painted newspaper offer a great backdrop for words or pictures. Use a combination of different paints. Try splatter painting your bookmarks. Use paint or markers to write text or draw in designs or pictures. Glue newspaper, pieces of tissue paper, or corrugated cardboard to your bookmarks. My daughter even glued a small feather to hers. Glue the full bookmark over a piece of pretty scrapbook paper and then cut out the shape so the back of the bookmark is the scrapbook paper design. Use a hole puncher at the top of the bookmark and then paint a layer of Modge Podge over the top of the artwork. String a ribbon or a piece of yarn through the hole to finish it off. Use your bookmarks in your favorite books. Don’t forget to encourage your kids to love reading by reading to them every day and get a free trial of Reading Eggs to get your kids on the right path to learning today.